Donald Trump is more entertainment for the media, than a front-runner per se. They may not want to admit this, but especially in the US, where campaigns are fought and won with war-like strategy, it’s always been useful (to the media) when there’s a wild-card. It seems as if Trump is trying desperately to fill the void left by Sarah Palin (remember her attack on ‘lamestream‘ media?) Which is why his attack on Jorge Ramos of Univision, is enlightening. He knows it will guarantee coverage. Sadly this is also the strategy of terror organizations, as we have seen in recent months. Think ISIS, and its despicable acts against journalists. Or Wednesday’s cold-blooded murder of two reporters in Virginia. The killer seemed to anticipate that this would get him media coverage, making sure he distributed the story himself, via social media. A pretty pathetic use of social media,or any media for that matter. He was just looking for attention, not change. Most of you know how I dislike the word ‘cloud’ as a catchall for anything accessed online. So how about getting used to balloons? As in Google’sProject Loon that has been in the works for some two years, and now is supposed to be set to launch in Sri Lanka. It’s a crazy, heady idea. Sri Lanka will be the first country to get ‘universal Internet access’ as TechCrunch put it. I just got back from Sri Lanka, and did an extensive train and road trip with the family. I experienced first hand what connectivity is –and is not. The new, fast highways are obviously connecting more people to more opportunities. The Telcos are providing easy-to-get (via a scratch card) low-cost bandwidth for smart devices. There is growing free Wi-Fi presence in towns as diverse as Galle, Anuradhapura, Kandy and some places in Jaffna; even on a train we took to the hill country! Access does get spotty and sluggish at times, but the appetite for connectivity is growing in leaps and bounds. Here’s why I welcome this. Not for the obvious reasons, such as giving everyone including tuk-tuk drivers or election monitors the ability to tweet or upload pictures – which could be useful in and of itself. Education: First sorely needed bandwidth to homes, schools and offices will change the game. I was at one outstation school, and the science teachers had to use a dongle to get online. ‘Universal access’ for schools would change the dimension of how learning takes place beyond the Google search. Young people could be empowered to create content and not just consume it. It’s about time schools got a better deal when it comes to connectivity. Why haven’t the telcos given schools a better deal? What will they do now? Political participation. Sri Lanka has demonstrated that despite the dismal examples of governance, that democracy and citizen participation works. ICTA reported recently that “Sri Lanka has shot up to 74th position in the United Nations E-Government Survey of 2014, after climbing 41 places since 2012.” Nalaka Gunewardene goes into rich detail about how Digital Democracy is at work. Beyond elections, this will affect transparency and accountability, when everyone has an uplink, a camera and a voice. There are obviously several more examples, which some of you might like to add. Please do! Hillary Clinton will be in our news feed, whether we like it or not. She is under scrutiny by conservative newspapers such as the Wall Street Journal, and more liberal writers. That’s par for the course, of course, when one announces an application for the top job in the country – an application tendered this early in the race. I know it’s not quite a race yet. It’s a photo-op here, a downplayed event there, and lots of conspiracy theories running behind her. Hillary has important credentials. As the then secretary of state, she did a long ‘internship’ in world affairs, but needs to learn the simpler arts, in domestic affairs, for instance. We also want to see her being more accessible, more forthright and transparent. She once presented Russian Foreign Minister Sergey Lavrov an unusual gift – a ‘reset button.’ As the race heats up, she may need to borrow that button, since citizens need to know what the former first lady (FLOTUS, in White House speak) might do for them should she become POTUS. I came across these pictures taken during a series of webinars on social media I conducted in late 2010, and it made me realize how far we have come. Or what we have left behind. The series was called Passport to Digital Citizenship. 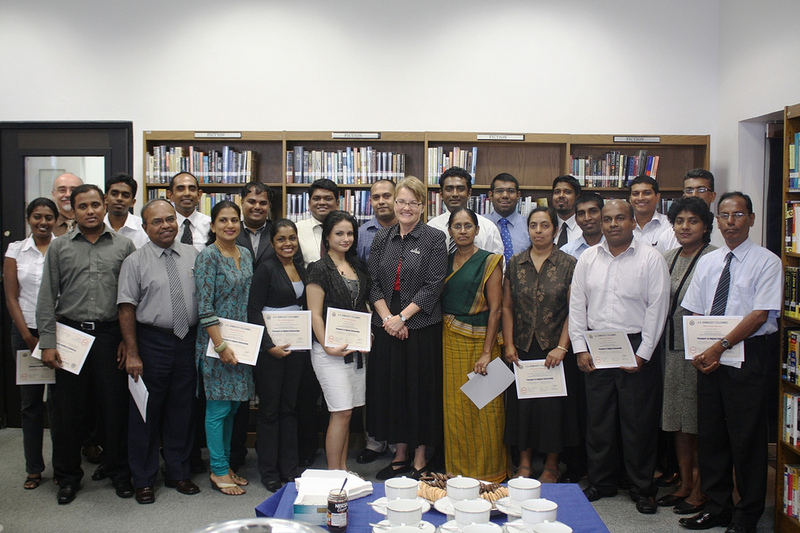 I have met some of these ‘students’ who have subsequently gone on to do amazing work in the digital space in Sri Lanka. But now that I teach a different age and demographic of students, it is interesting to see how some major concerns of digital citizenship, have been over-ridden by new ones. Then there was no WhatsApp, and Instagram or Snapchat to think about. At that time, it was almost inconceivable that these new digital channels would practically revise the political spectrum in Sri Lanka – as Nalaka Gunewardene has well documented. Thank you for the experience all of you who attended. What are the most important tools you use in your work today? More importantly what are your biggest challenges? Privacy? Information overload? Earning trust? PR? They are funny, memorable, and provide plenty of water-cooler conversations. The campaigns know it. They must have gag writers on staff to supplement their communications and marketing people. The unfortunate thing is that they work. Not the lines, but the distraction. They provide a sidebar to the main event that eventually drowns the real issue. When Obama, fresh from his speech in New York this week (the annual Alfred E. Smith Memorial dinner, where both Obama and Romney delivered great one-liners, a tradition of that white tie event) fired up a crowd using a coined word ‘Romnesia‘ it supposedly lit up social media. Sure, it gave the president a stick to poke at his challenger, who has been gaining ground. But in the last few weeks to the election, it is a huge distraction from what Obama and Romney should be doing: telling voters, especially those uneasy about both candidates, what they stand for. It may have pricked the bubble about the self-created entrepreneur, but it also treats an important election as a referendum on who citizens don’t like, as opposed to what they really want. Bumper stickers are all about this. Bumper-sticker campaigning just feeds this mentality that we don’t really need to know (or read) the candidate’s policies, so long as we keep up with the tweets, and let the one-liner define our choice. Locally, in Phoenix, we have one of the most intellectually embarrassing senate races, by Jeff Flake and Richard Carmona. Going by their ads, I personally don’t want any of them representing me. Like both major parties, they spend millions on tarring each other’s reputation instead of telling us why we should pay their salary. Worse, they hide behind shady organizations that pretend to represent us, who pay for these spiteful spats. Take a guess: who might ‘Americans For Responsible Leadership’ and the ‘Committee for Justice and Fairness’ represent? They are quite opaque –by design. These political action committees (PACs) poison the waters of democracy. Why? They are still stuck in the mass media mindset, imagining that he who shouts the loudest will win our vote. Their ‘message’ –a mess of pottage, really– is clear. Don’t think, just vote! Their goal is simple, as in E.B. White’s words: “be obscure, clearly”! To think we as a country spend billions trying to introduce democracy to other parts of the world! The cynical side of me wanted to skip the presidential debate this Wednesday. But with so much build-up and punditry surrounding this made-for-TV event that pretends to be a way a democracy decides on its leader, I gave in. Truth be told, I am one of those decidedly ‘undecideds.’ I had decided to not be influenced by this stylized boxing match. I happen to teach Language Arts, so I wanted to watch it from the perspective of rhetoric. I often I ask young people to pay attention to turns of phrase, juxtaposition, and tone-of-voice. It’s how writers and speakers hold –or lose– an audience. So in this debate I was less concerned with facts and half-truths (we have to expect plenty of the latter, in this setting) and more with how the idea was packaged and delivered. 1. Trickle-Down Twist: Many of you are all familiar with trickle-down economics, a term often associated with president Reagan, but really refers to supply-side economics. I liked how Romney added a twist to it, by introducing the term trickle-down Government. Got that? A 48-word summary of an analysis may have had its place at some dull economic summit, but not here, with a debate divided into tight ‘pods’ by the moderator. 2. Tax Cuts Vs Tax Offset. Obama tried to clarify his position versus Romney’s as being based on tax cuts. Romney may have been, as numerous fact-checkers very quickly pointed out, tiptoeing with his numbers himself. FactCheck.org called him “a serial exaggerator.” Romney’s website does state clearly he plans to “Make permanent, across-the-board 20 percent cut in marginal rates” and “Eliminate taxes for taxpayers with AGI below $200,000..” But who reads campaign websites? It’s too much work; much easier to watch the debate pod! Romney’s zinger about the airplane +White House +facts was perfect for the Twitterverse. 3. Birdseed For Social Media. Speaking of Twitter, you have to imagine that Romney’s attack on Big Bird was a well planned sidebar. It is a silly piece if information, since PBS accounts for such a minuscule amount of government money (the govt spends $0.223 billion on PBS vs $4 billion subsidizing oil companies). But it adds color to a dull fight between two men in suits on a dark stage. I believe Big Bird was seeded by those the Romney campaign who knew social media users would love something not-so-boring to tweet about. 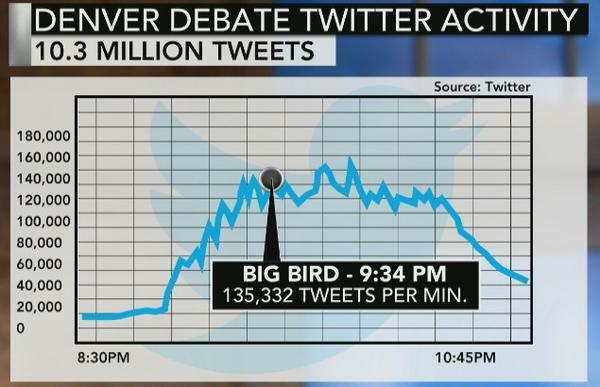 The yellow bird generated 135,000 tweets per minute while the debate was on! One of the many insta-Twitter accounts that ensued, @FeedTheBird, has tens of thousands of followers. Will social media, or even the ‘verdict’ of who won, matter in whom the country chooses? My optimistic side believes it will not. But we cannot discount how TV debates have indeed swayed elections. If you are cynical, you will want to believe that we citizens feed this machine that produces a televised horse race. We are ready to scan past the deeper arguments and remember the zingers, and the candidates feed our appetite.